What's the ideal amount of coffee to use per cup of water in a French press? I've looked at various online resources, which all gave me a different amount. Some call for 2 tablespoons per 6 oz of water, others per 4 oz. Others said to use one or the other, and add water after brewing if it's too strong. So what's the ideal blend for extracting the best flavor? I don't know if there's an ideal ratio since this is really about how strong you want the coffee to be. It depends on the strength of the roast you're using, the grind, and how strong you like the coffee. I generally use 2 tbs / 6 oz, but vary it to taste. There's a whole, whole lot than can go into it, but a great starting place is a ratio of 17.21:1 water to coffee. That is, if you have 500 g of water, you should use 29 g of ground coffee. What the ratio really does is specify how concentrated the coffee should be. Once you've set your ratio, there are many other variables to play with to make the coffee taste wonderful including grind size and consistency, bloom time, brew time, filter type, pour method, etc. Lastly, and please tell me if this isn't kosher, but I've made an iPhone app that will handle the coffee and water weight conversions automatically, as well as timing the brew and detailing a couple guidelines for different brew methods. It's available on the app store as Brew Control. I am always a bit wary when people give such precise answers about coffee making. At the end of the day they only thing that matters is if you enjoy the taste of it. Once you think you can reproduce your drink consistently, vary one variable and see how it goes. I have an espresso machine at home so my habit with my french press is to dose what looks like 14grams and use about 180ml water. 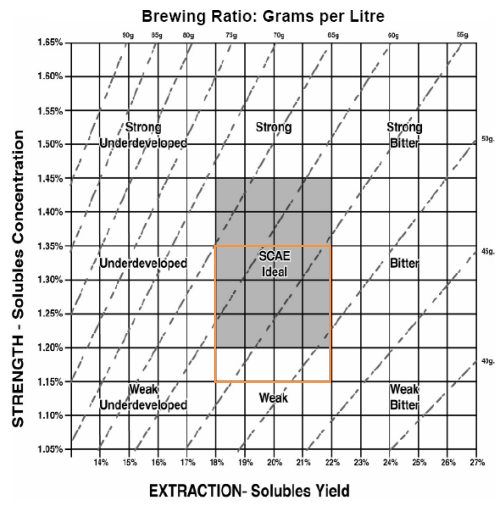 As many have said, the ideal brew ratio is what tastes best to you, and you can't experiment productively to find that ratio without controlling the other variables. Even then, unless you get unhealthily obsessive and start growing your own cloned beans hydroponically (and/or start producing cloned civets) you'll find things can change from batch to batch of beans. That being said, research has been done into preferences and can provide both a good starting point and an idea of what to expect if you stray too far outside typical ratios. Americans prefer theirs weaker (www.mountaincity.com/brewing-1.html), Europeans prefer somewhere in the middle (graph below), and Norwegians tend to prefer theirs stronger (www.mountaincity.com/brewing-3.html). I'm going to press the point is that it's subjective and based also on the size of the ground coffee as well. Water quality will also affect flavor. I had to use the trial and error approach to find what I like and what my family likes. But the advice to go strong is best because you can dilute it like a cafe americano. Grind size is important for extraction and ease of plunging (and preferred sediment quantity). No doubt there's a science to it, but it's really art so don't go all precise and make it a clinical experience or a scientific experiment all the time. Go Zen and not Einstein on coffee and tea. The best way to do it is by weight, if you have a kitchen scale. 10 grams of coffee for every 6 ounce cup of water is a good starting point. You can then adjust up or down by say up to 20% from there depending on your preferences. A nice thing about doing it by weight is that it works if you are grinding your own beans; you don't have to grind a guesstimate amount and then end up with extra. The difference in both the variation in ratios and the variation in "cup" meaning which other answers here note, is the Atlantic Ocean. The variation in the word "cup" is of the same order: American machines typically provide measurements in 6 oz cups. So, if you have an 8 "cup" machine, that's 8 American "cups" x 6 ounces = 48 ounces, for which you might use 16 tablespoons - but is also 12 European "cups", for which you might use 24! The one I use, of course. Seriously, though I would recommend starting a bit of the strong side, because strong coffee can be thinned with the addition of hot water, but weak coffee is unrecoverable. I'm not going to be precise here at all. But for the coffee I use, which is ground a bit finer than french press is supposed to be, but courser than a cone filter grind, I find that three rounded scoops (using the round (semi-spherical) scoop that comes with every coffee maker -- not the conical one) for one French (32 oz) Press serves me quite well for my morning fix. If I'm entertaining, I'll put in 5 rounded scoops, and water the coffee after it has been poured. I find this produces better fruity-winey notes, but is a bit of a hassle on the daily brew. It depends on so much. How strong do you like your coffee? How much is the coffee you're using roasted? How finely is it ground? (Finer grind = more surface area in contact with the water and therefore a stronger brew, but also means more grounds will find their way through the metal mesh of the press.) How long do you let it brew and do your stir it at the beginning? Again half way through? Take anyone's suggestion here. Choose one at random. Start there. And tweak the variables until you find your favorite. It won't be exactly the same as anyone else's. That's why one takes at-home coffee making seriously in the first place. I use a 1/8cup (30ml) scoop for a medium coffee cup. Three scoops to fill the press for 2 full mugs. I just do 3 scoops (the scooper it came with) to 4 cups of water. Came out Perfect. Used regular maxwell house coffee. No grounds whatsoever! This page (http://stumptowncoffee.com/brew-guides/press-pot/) advises "Grind 56 grams (about 8 Tablespoons) for the 8-cup French press." Just did exactly what it said and got myself a pretty good coffee. It is strong but not too strong, probably Starbucks level. I use 1/2 cup of whole beans (ground semi-coarse) for my 32 oz press. After adding the water I stir it up with a chopstick- then wait about 4 mins till press and first pour. I do let the balance of the coffee stay in the press and get bolder as the pour continues. Love every single drop-every single time! Not the answer you're looking for? Browse other questions tagged coffee water french-press or ask your own question. What is the the best coffee-water ratio?